This is one of my favorite poems. 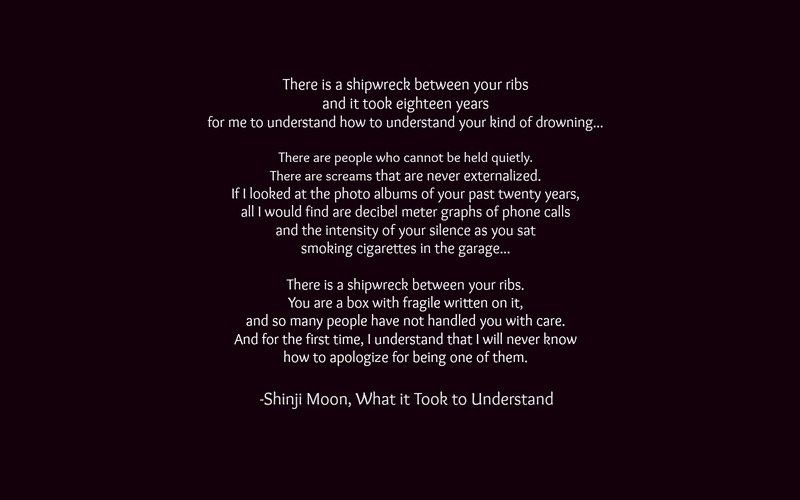 Written by Shinji Moon, a young and contemporary poet living in New York City. She’s only 19 years old and I don’t know where she gets her poetry talent. She’s composed of metaphors, ideologies, broken hearts, and words that linger in your bones and in your whole being. I just love her! Anyway, as per the poem, how do we exactly know if we’re already hurting another person, especially those people that we loved the most? Sometimes, we thought we’re loving them, that we are protecting them, that they need saving and we are the ones who can actually do the thing. And by doing that, we have no idea that we’re slowly pulling their arms and legs and breaking them in the process. But how do we know? We will never understand their smokes and photo albums and beers and huge handwriting. We will never understand them until we suffered the same fate. And once we do understand what’s happening, it’s always too late to apologize.